– Vaughn Gittin Jr. signing autographs and taking pictures. He also drove a v8 powered Shopper Chopper around the show while hurling free gear into the crowd. Yeah, it was awesome! What a day. The sun was shining and the temperature was as close to perfect as it gets for August in Pennsylvania–holding steady in the low to mid 80s and low humidity. With the gates opening at 9am, things got started bright and early, and in a spirited fashion. It did not matter from which direction you were coming from; if you were traveling towards Media, PA on August 11th, you were going to run into more than a couple Mustangs along the way. You wouldn’t have been able to hold back a grin if you were in one of the Mustangs hopping on the PA turnpike that morning, only to find 1-in-3 cars was also Mustang and headed to the exact same destination. Even though you would not have known those drivers personally, you couldn’t help but feel a certain nostalgia that brought you back to past cruises with friends, late night cheese steak runs (or whatever your hometown feel good food might be), or long road trips simply for the sake of taking your car out for the drive. Rolling up to the gates, you were met with lopey cams, paint as smooth as glass and the sweet smell of petrol. 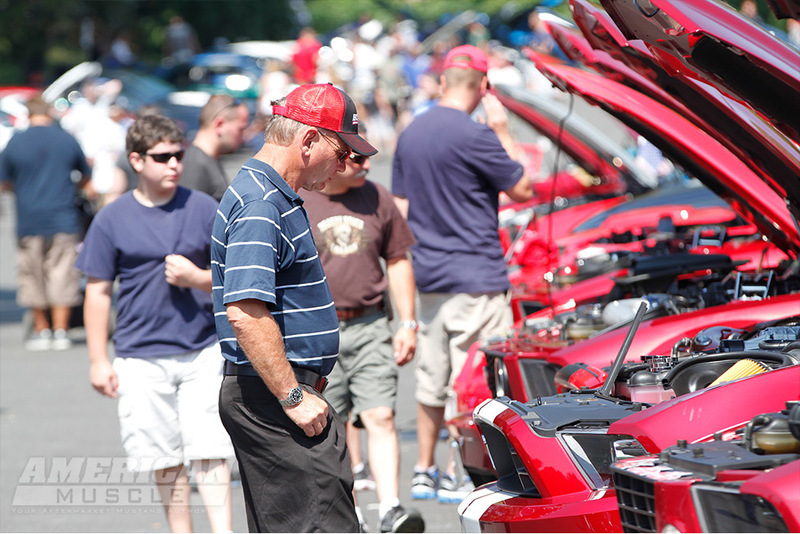 The first thing that hits you is that this is not your typical car show. Anyone who hasn’t had the pleasure of seeing 1,400 Mustangs all lined up in one place might not get it, but being that engulfed in Mustang pride is quite the sobering moment. You realize why you’ve bought and modded your car, and get a great chance to see the vision others have for theirs. You see why Mustang owners are so passionate, and it gives you a sense of belonging and pride knowing you’re part of a community that shares a similar taste and style. Personal tastes knew no bounds as there was a TON of different Mustangs, from an original 1968 Shelby GT500 and a to plasti-dipped 2011+ GTs and even a Fox Body with a Toyota Supra motor. There truly was something there for everyone. The Shopper Chopper was plain awesome. 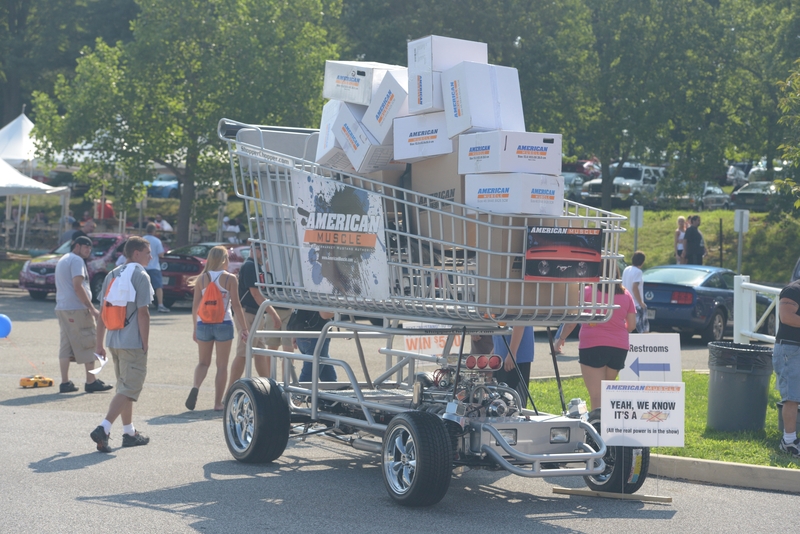 Despite it having a chevy motor (we know…) it worked great for dispersing free AM and RTR gear courtesy of Vaughn Gittin and AmericanMuscle. Oh, how tempeted we were to let him drift a two story shopping cart, but we went against our instincts and decided against it. It might was too top heavy for the kind of drifting Gittin would have gotten into. The beautiful AM Girls were out in full force, talking with owners and selling tons of raffle tickets. They did a wonderful job raising money for ALS and getting people involved in the raffles. The dyno showdown had everyone’s attention and ended in spectacular fashion. The 2004 Cobra was the top dog posting 795rwhp, topping the turbo’d Boss 302 by only 7rwhp! Oh and let’s not forget about Mishimito‘s 20 foot giant penguin. Chip Foose & Vaughn Gittin Jr. Both Chip Foose & Vaughn Gittin Jr. were of course crowd favorites, signing autographs and taking pictures with fans through the show. Each picked their favorite Mustang and presented the owner with a personalized award. Vaughn Gittin of course took the Shopper Chopper for a spin with Justin and the AM Girls, all while tossing free stuff to the crowd. 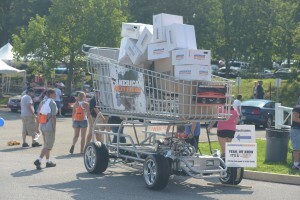 A pretty cool site if you’ve never seen a two story v8 powered shopping cart driving around before. Chip surprised everyone and held a live auction for signed wheels and a Magnaflow exhaust kit, among other things. The grandness in his gesture wasn’t the auction itself, but that he donated all the additional money raised to Alex’s Lemonade Stand. Let us not forget the most important detail from this year’s show. 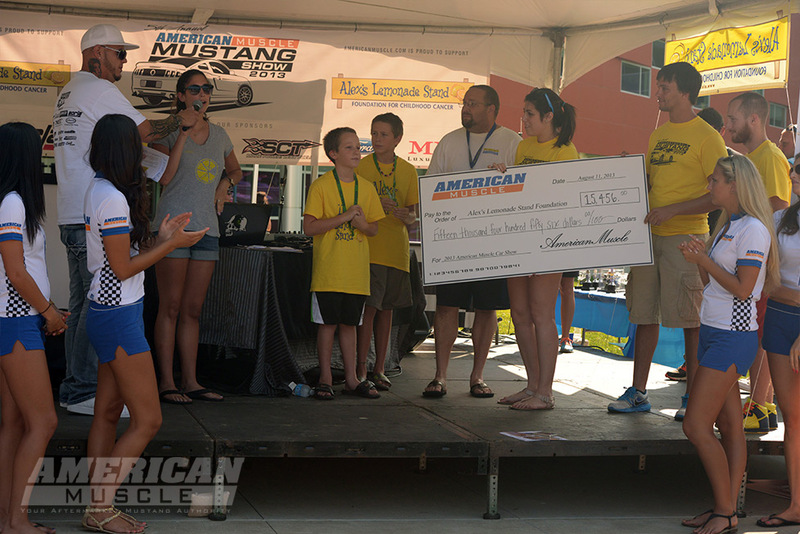 Thanks to you, the 2013 AM Car Show was able to raise $20,522.45 in donations to Alex’s Lemonade Stand, helping to fight childhood cancer. You donated, bought the raffle tickets and the lemonade. We couldn’t have done it without you. 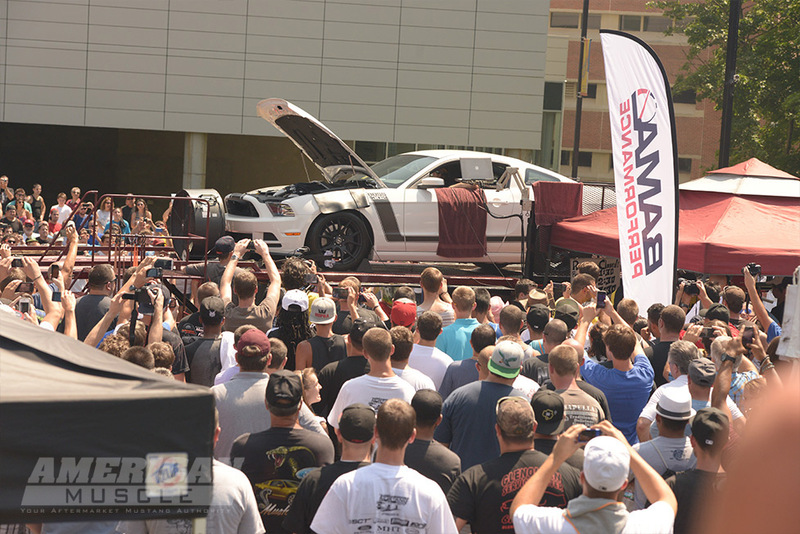 AmericanMuscle would like to thank everyone who attended this year’s show and a special thanks goes out to those who donated to ALS! We hope to see you all again next year! Leave us a comment telling us what you enjoyed from this year’s show and what you’d like to see next year!